With Christmas Day still nearly a week away we’ve put together a few little SCRAPtastic Christmas Crafts ideas to keep you and perhaps more importantly, the children, occupied. All fairandfunky SCRAPtastic crafts use recycled materials that you can find around the home: don’t throw it away – make something! You could use paint, and pens to decorate your SCRAPtastic crafts but that does make a lot of mess….it’s up to you! At fairandfunky we use PVA glue but sticky tape and other glues would work just as well. We’d love to see your creations: do share photos of your finished SCRAPtastic Christmas Crafts with us on facebook, twitter or Instagram. SCRAPtastic Number 1: Cardboard tube Christmas! Simply gather together scraps of paper (Christmas card envelopes come in handy!) and turn your kitchen roll (or toilet roll!) 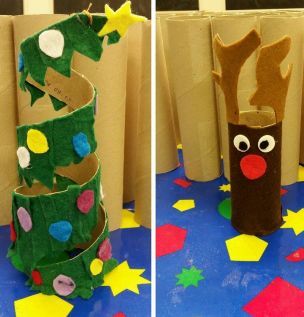 tube into a Christmas character of your choice: Olaf, Rudolph, Father Christmas or a tree! Stick them to a cardboard base to use as a festive pen pot, or hang on your Christmas tree with some ribbon. SCRAPtastic Number 2: Yoghurt pot trees! 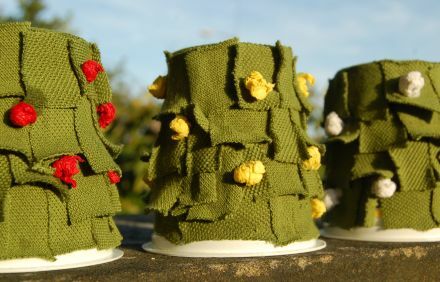 Either use fabric scraps or sharpies to decorate a few yoghurt pots to make a family of Christmas trees. Make 3 and you have yourself a little magic trick, make more and you could have enough for a game of skittles! 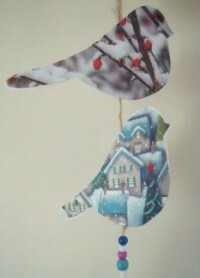 SCRAPtastic Number 3: Christmas card mobiles! Perhaps a little early to be cutting up Christmas cards but these mobiles can also be made from cereal boxes and then decorated with scraps of wrapping paper, or coloured in. You can make absolutely any design – google a template if you’re stuck! And if you have a few beads spare you can add them to string for extra sparkle! SCRAPtastic Number 4: Candle holder stars! One for older children as the metal can get very sharp. 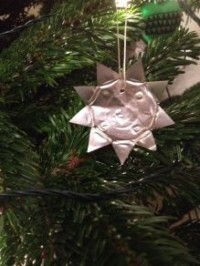 Simply cut triangles around the end of a used tealight holder, squash down, and ta-dah….you have a star! Gently pierce with a pair of scissors and thread through a piece of string or ribbon to adorn your Christmas tree. SCRAPtastic Number 5: Crazy Christmas Angels! 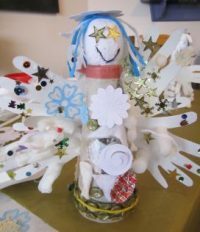 You need kitchen rolls, scrap paper, sparkly bits and pieces and a lot of imagination to make these angels! For the wings – draw round your hands on white paper, cut out, and stick on the tube. Old envelopes (opened out) are a great source of scrap white paper.